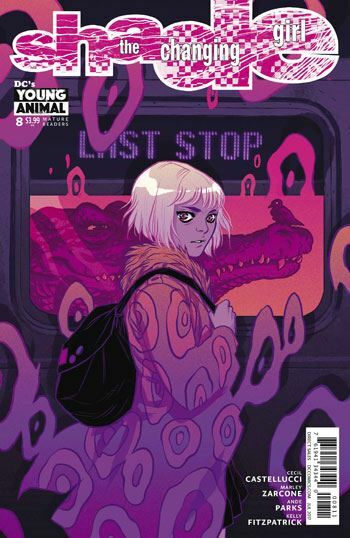 It’s funny, in earlier reviews for this book I looked back at the Peter Milligan series, and commented on how well it worked when that incarnation of Shade was travelling to different cities, and wished that this version would do something along those lines. 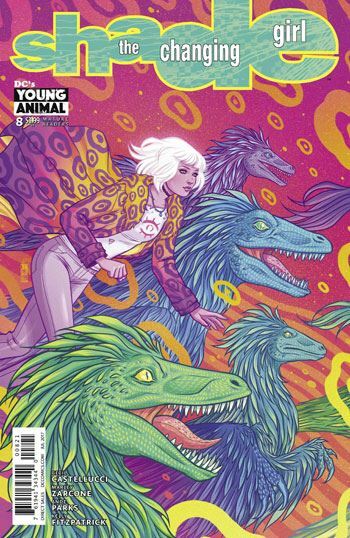 Now, lo and behold, Shade, the Changing Girl is on the move, and has come to Gotham City. We still get a couple of scenes from her hometown, with her friends and family dealing with her abrupt departure, as well as the subplot on Meta, as Mellu forces one of her friends from there to become an agent of the madness. So I am very glad to see Shade exploring the city. I very much enjoyed her scenes in the museum, and her experience of great theatre. Castelluci selected some interesting works for her protagonist to view. I mean, Shade is in GOTHAM CITY! There is one brief verbal reference to Batman, but that’s it. One simply gets the feeling that she is in New York City. Bringing Shade to Gotham seems like a great idea, but one (or at least I) would fully expect her to have some interaction with Arkham Asylum, and the madness there. Now it’s not like she moves on before the end of the issue. Shade will be in Gotham for a while longer, so maybe she will reach Arkham sooner or later.